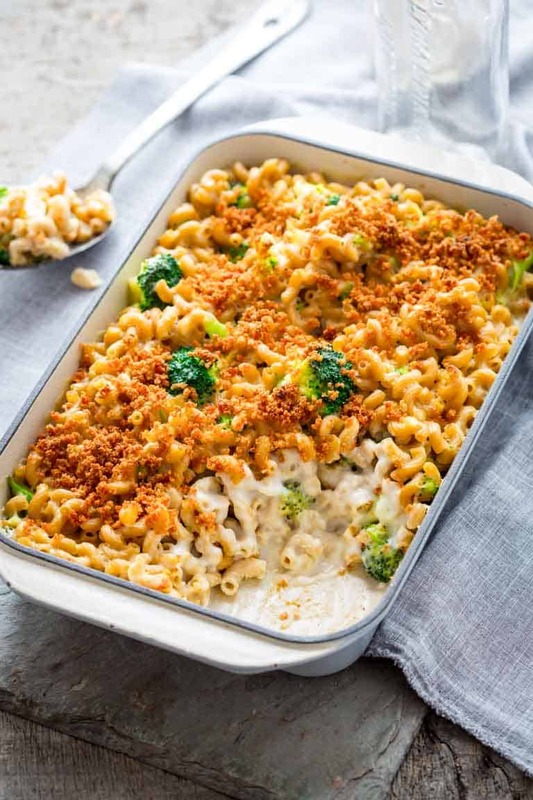 This delicious baked macaroni & cheese with broccoli is a healthy make-over of the classic casserole. 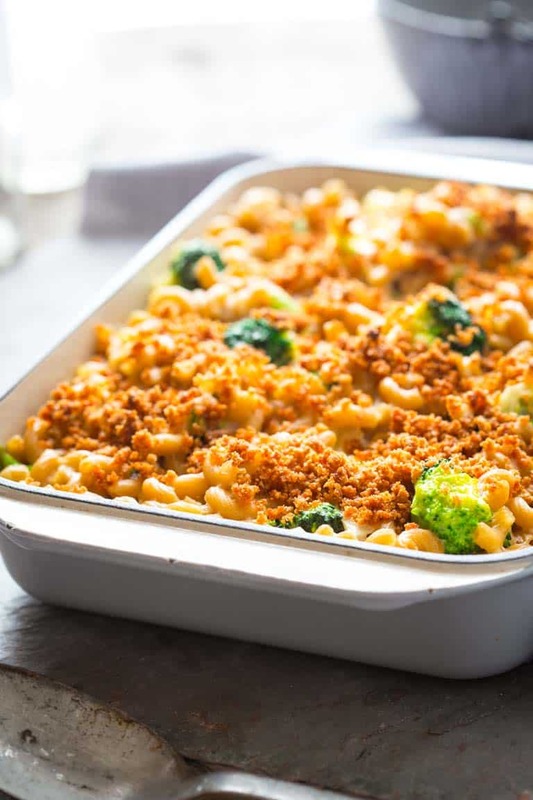 But with its crunchy golden brown breadcrumb topping and uber-creamy cheese sauce you won’t miss a thing. This is a family weeknight dinner favorite and is ready in just 45 minutes! I originally shared this recipe on January 11, 2011. I have updated the images and some of the text today. Welcome! For those of you who are new here, you may want to sign up for my email list, or follow me on instagram to stay in the loop. For those of us who are committed to eating healthfully, frozen produce is super helpful. By the end of the week, or if you’re snowed in (yes, that does happen in Vermont in the Spring!) with an empty produce bin, having frozen vegetables handy can mean the difference between a healthy home-cooked meal and fat-laden take-out. And don’t worry about the nutrition end of it. Did you know that frozen vegetables can actually be more nutritious than fresh? This happens in some cases because they are picked and frozen at the peak of their nutrition. Here is my cheesy, ooey, gooey Macaroni and Cheese with Broccoli. It is comforting (and healthy) for a mid-week supper. Honestly my family loves it so much they request it for special occasions too, like for their birthday dinners. I even made it one year for Valentine’s Day baked in a heart-shaped baking dish. With it’s creamy cheesiness, I don’t even think they know how healthy it is. I love that it requires no planning because the ingredients are always on hand. I usually use a 10-ounce box of frozen chopped broccoli, but a large crown of chopped fresh works well to if you happen to have it. I’ve also made it with edamame, which my kids will gobble up like jellybeans. Try it with whatever vegetable your family will eat. To maximize your time, get all your ducks in a row! Start boiling the water right from the get-go, and get your oven pre-heated. Since they can take a while to heat-up, if you start that before you start chopping and measuring, you’ll save a bit of time in the end. Undercook the pasta in the water. It is going into the oven, so it will keep cooking in the sauce. If you’re using fresh broccoli, add it to the cooking pasta at the end. To make the healthier cheese sauce, I use a slurry method. This is different than a roux because it doesn’t require any butter (I like to save my fat calories for cheddar cheese thank you very much!) To ensure the slurry method works best, make sure you preheat the milk in the skillet. Then use a little of the milk to mix with flour to make the slurry. Here I boosted the flavor of the sauce by enhancing the slurry with some Dijon and salt and pepper. Once the milk in the skillet is steaming hot, just whisk in the slurry. It’s important to keep stirring and whisking at this point to keep the sauce from becoming lumpy. Pay attention to those corners! Only after it thickens, remove it from the heat, then stir in the cheese. That’s the fool-poroof way of melting the cheese, without causing it to clump or curdle. Note: if you’ve opted to use frozen chopped broccoli, you just add it right into the cheese sauce. Also note, this will seem really saucy at this point, but as it bakes the sauce will absorb into the pasta for that perfect creamy texture. Since it is already pretty hot, it only needs 15 or 20 minutes in the oven to become bubbly and crusty. Thanks for reading! For those of you who are new here, you may want to sign up for my email list, or follow me on instagram to stay in the loop. 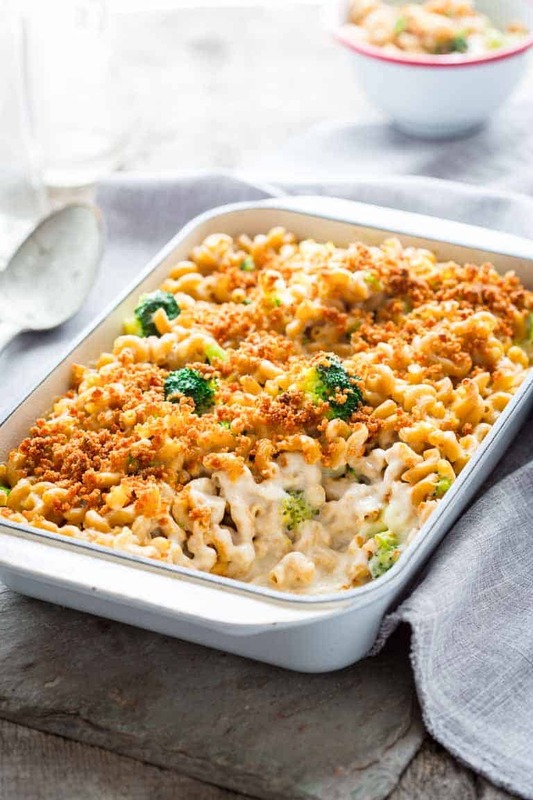 This delicious baked macaroni & cheese with broccoli is a healthy make-over of the classic casserole. 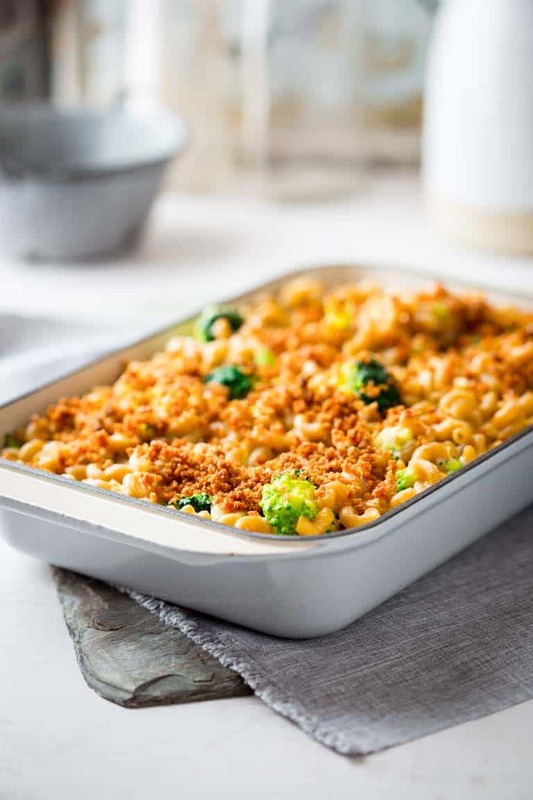 With its crunchy golden brown breadcrumb topping and uber-creamy cheese sauce you won’t miss a thing. This is a family weeknight dinner favorite and is ready in just 45 minutes! Preheat oven to 400 degrees F. Coat a 2-quart baking dish with cooking spray. Bring a large pot of salted water to a boil. When water boils cook macaroni 4 minutes less than package instructions. Add the raw fresh broccoli if using (the frozen broccoli goes in later if you are using that.) Continue cooking for 2 minutes longer until the pasta is slightly undercooked (the broccoli should be bright green and crisp tender.) Drain thoroughly and return to the pot. Meanwhile prepare cheese sauce. Heat 2 cups milk in a medium saucepan over medium-high heat, stirring often until steaming hot. Whisk together the remaining 1/2 cup cold milk, flour, Dijon, 3/4 teaspoon salt and white pepper in a medium bowl until completely smooth. Whisk the flour mixture into the steaming milk and bring to a simmer whisking often until smooth and thickened. Remove from the heat and stir in the cheese. If using the frozen thawed broccoli stir it into the cheese sauce. Stir the cheese sauce into the pasta. Transfer the pasta mixture into the prepared baking dish. Stir together breadcrumbs, paprika, 1/4 teaspoon salt, garlic powder in a small bowl. Drizzle in olive oil and stir until completely combined. Sprinkle the crumbs over the pasta and transfer to the oven. Bake until the pasta is bubbling and the topping is golden, 15 to 20 minutes. LOVE this! I’ve been looking for a great casserole recipe! Bookmarked! I made this tonight for my husband and myself. It was delicious! I could see this going over well with kids because the broccoli isn’t at all obtrusive (in fact, I might add more next time). Thanks for the great recipe! I plan on making this often! Mmmmm looks fantastic! I will have to add some broccoli the next time I make mac and cheese! Thank you Chris! Have a great day. I love this feedback Angela. Thank you so much for coming back by to let me know how you liked it. If this isn’t a family-favorite in the making, I don’t know what is. Yum! Thank you Regan, and for coming by to say hi today. Hope you’re well. is broccoli and cheese the best combination ever? It’s the only allowable vegetable in the coveted mac and cheese right? I do love broccoli and cheese! It is classic. I also add other veggies though, butternut squash, cauliflower, edamame. I’m always trying to get in as much veggie love as I can. Ha ha. Could I make this ahead by one day and bake the next day? Or would the broccoli get mushy? The broccoli should be totally fine. But in step 4 do the following: transfer the mac and cheese mixture to a baking dish, cover with foil and refrigerate up to 1 day ahead. Bake, covered, until heated through. Then proceed to make the breadcrumb topping. Remove the foil, top with crumbs and bake as directed above. I wonder if this would be good with tuna added.All ingredients seem Healthy. Hi Joanne! I hadn’t thought of it. If you give it a try let us know how it tastes, as I am sure there are other readers wondering the same thing. Happy cooking! I made this exactly as written and I think it’s fabulous! This is going to be on my meal rotation list. It’s great during lent for Friday night dinner. I may adjust a bit since I like my food a little spicier, and add some cayenne powder. I might also add some chicken for off-lent meals as well. Great recipe! I am so glad you discovered this macaroni and cheese recipe Karen and that you love it! I really appreciate your taking the time to come back to let me know. It means a lot! Happy cooking! This recipe was great. I loved the flavor of the Dijon and the crispness of the breadcrumbs. Thank you, I will absolutely make this dish again. I am thrilled you loved it! Thank you so much for coming back to review. I really appreciate it! 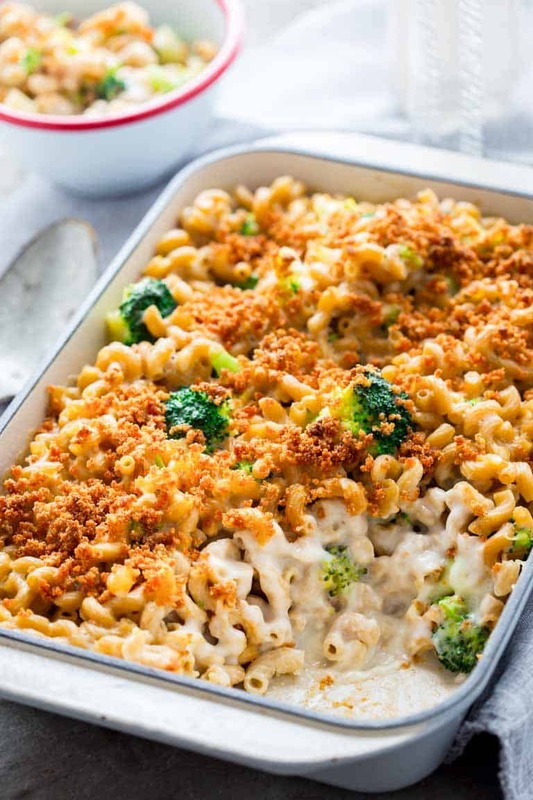 I am always looking for different mac ‘n cheese recipes to try and love the addition of some veggies! Putting this on my dinner menu for sure. I am a SUCKER for any kind of mac and cheese. So smart to add a little broccoli goodness! 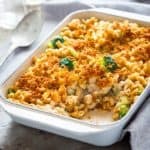 Originally posted on 9/13: I am always looking for different mac ‘n cheese recipes to try and love the addition of some veggies! Putting this on my dinner menu for sure.